We’ve all either seen it or heard about it from our friends or Facebook posts. Ronda Rousey, after a perfect 3-0 amatuer MMA record and 12 professional MMA wins, was defeated by boxing champ, Holly Holm on Saturday. The fight, scheduled for five five-minute rounds, ended 59 seconds into the second round with a well-timed kick to the neck. But I’m not here to analyze the fight. I’m here to talk about defeat. 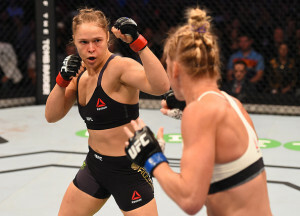 Ronda’s wide range of talent and her fervor for the fight have made given her the reputation of being unbeatable. So many women tried, but they couldn’t even come close to beating Ronda. Whether it was her martial arts skill or her oozing confidence that caused it, Ronda couldn’t be touched. 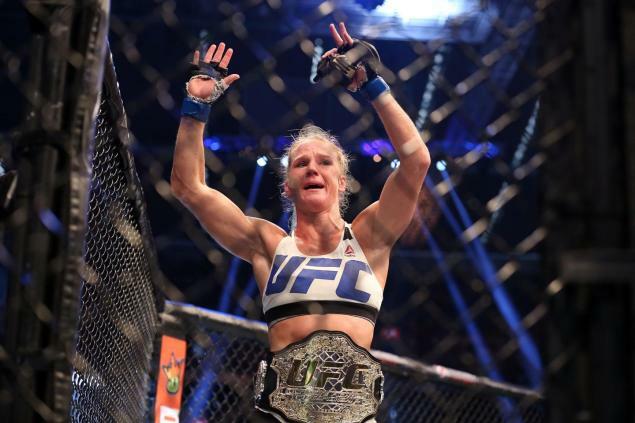 The world was in awe of her because of it, and she drew in millions of viewers for every fight. We were all waiting for that the moment: the defeat of an MMA phenom. 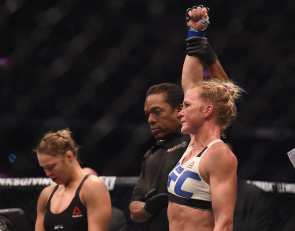 Holly Holm made history on Saturday at UFC 193 when she became the first woman to beat Ronda Rousey in MMA. Some fans were disappointed to see the champ lose her belt. Others were celebrating the flawless technique and grace exhibited by Holly. The win by Holly proved that time and dedication to your craft can make you successful, but the fight also proved another thing: no person is unbeatable. It seemed to be a unanimous mindset that Ronda was and would remain the women’s bantamweight champion of the UFC. To many fans there was no other alternative. There was no woman in the UFC who could take the title from Ronda. Ronda won 12 straight professional MMA fights, many of them in the first round with a destructive armbar. Her judo throws are flawless, and her demeanor is enough to make people run in the other direction. How could a woman so strong, so confident, so technical be beaten? The answer is… it can happen to anyone. There is no person on this Earth who cannot lose. No matter the time you put into training, no matter how much you’ve mentally prepared, no matter how much you want the win, there is still the potential of loss. It may be a difficult pill to swallow, but it’s one that we all must force down at some point in our lives. Whether it’s messing up the delivery of an important work presentation, getting a D on a math test, or placing second in the jiu jitsu tournament after working so hard for it, we all have to accept defeat. Although it stinks, and no one likes it at that moment, losing anything can be a huge defining moment. Messing up, failing, or losing can motivate us to work even harder for the next presentation, test, or tournament. Winning feels great for a few hours or maybe days, but we tend to remember our losses until the next time we win. We can let losses hang over us like a dark cloud, or we can let them be a guiding light for what we need to work on for next time. Losses teach us a lot about ourselves. For example, after losing a jiu jitsu tournament it is easy to determine which techniques we need more work on. If there is footage of the match, you and your coaches can point out your weak areas in your game and help you improve in those areas. Losing hurts in the moments afterward, but if you harness its power it will help you in the long run.